Not Sure if We are the Right Choice? The trainer is fully qualified to teach mindfulness. He has been practising mindfulness since 1997, which means that his teaching style is firmly embedded in a direct experience of meditation practice. You will receive printed handouts at each session, as opposed to handouts sent by email only. We offer email or telephone support in-between sessions, if participants request it (free of charge). We provide mats, cushions and blankets for lying-down practices, so you don’t have to bring anything with you to the sessions. You will receive a set of three CDs with guided meditations (or we can arrange MP3 files for download if you prefer). 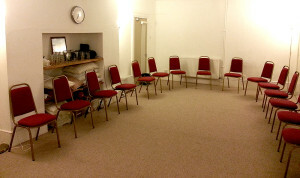 Our course venue is spacious and quiet, making participants feeling welcome and comfortable. We also provide complimentary hot drinks and biscuits during course sessions. Each 8-week course includes an all-day retreat, which is held in a beautiful venue just outside Bristol, surrounded by green hills and horse pastures. We believe that learning can be fun and mindfulness does not have to make us solemn – when the mind is at ease, it naturally opens and we can learn much more.